The Venice Biennale is kind of like the Olympics of art. Every other year, each country picks a single artist to represent it on the international stage—a weird but interesting way to quantify success in the art world. So who’s the most interesting artist in America right now? Meet the 43-year-old sculptor Sarah Sze, whose complex installations are made from millions of fragments of found objects. Sze’s installation, which opened on Wednesday, is called Triple Point, and cascades from the roof of the American pavilion in a wave of bits and pieces and loops through the interior like a well-organized tornado. The piece, like many of Sze's science-inspired installations, has an unlikely connection to physics. It’s named after the thermodynamic concept of a temperature and pressure at which a substance exists at all three phases—gas, liquid, and solid—at the same time. Eclipse, 2013. Image courtesy of Sarah Sze, Courtesy of the artist, Tanya Bonakdar Gallery, New York, and Victoria Miro Gallery, London. Pendulum, 2013. Image courtesy of Sarah Sze, Courtesy of the artist, Tanya Bonakdar Gallery, New York, and Victoria Miro Gallery, London. Planetarium, 2013. Image courtesy of Sarah Sze, Courtesy of the artist, Tanya Bonakdar Gallery, New York, and Victoria Miro Gallery, London. Gleaner, 2013. 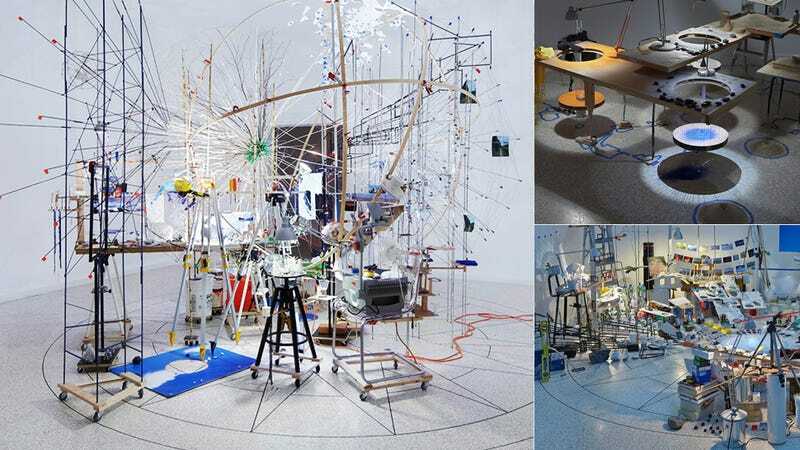 Image courtesy of Sarah Sze, Courtesy of the artist, Tanya Bonakdar Gallery, New York, and Victoria Miro Gallery, London.